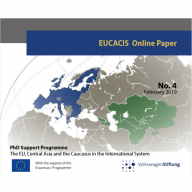 “The EU, Central Asia and the Caucasus in the International System” (EUCACIS) is a PhD Support Programme for Postgraduates and Doctoral Researchers in Central Asia and the Southern Caucasus, organized by the IEP and the Centre international de formation européenne (CIFE). Funded by the Volkswagen Foundation and the programme Erasmus+, it offers scholarships for three years to excellent postgraduates who are working on a doctoral thesis in political science, contemporary history or economics on a topic related to its thematic focus at a university or academy of sciences in the Southern Caucasus or Central Asia (including Afghanistan, the Kashmir region in India and the autonomous region Xinjiang in China). 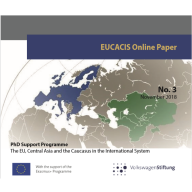 It is the objective of the EUCACIS programme to provide intensive PhD research training for its participants to bring them closer to international standards, to support them until they submit their doctoral theses, and to help them establish their own networks with other young researchers in the target regions and in Europe. This will be achieved through four international conferences (in Almaty, Berlin, Yerevan and Bishkek); three PhD schools in Berlin, Yerevan and Istanbul; two research training stays; and continuous online coaching. For information on the eligibility and the details of the application process see the project’s website www.eucacis.eu. If you would like to stay informed on all projects, events and publications, subscribe to the EUCACIS Newsletter.